Holy freakin' WOW, such a powerful book. This is a story mostly about survival and the legacy left by the residential school program in this country and how through darkness light can be found. 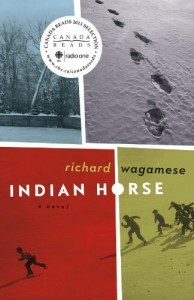 You hear about the horrors of the residential schools but until you read a story such as this, which I'm sure was formed from real life accounts, you don't really "get" what it must have been like for such young, impressionable human beings, forced to endure their fate, to live through, or die from. Ripped from their families, robbed of their language and culture, made indentured labourers and play toys of a perverted staff and then ignored by the very government that forced this life upon them, Saul and his school mates coped however they could. Then, when they leave the school system, if they've survived, to go out into the world, they run head-long into abject racism of the tallest order. It's sickening what our first people have had to experience. If you think from this that the story is all dark and dreary throughout, it is not. However, the punch comes and you feel Saul's anguish. Saul is a survivor though and that comes through loud and clear and left me rather teary, a good teary, in the end. Love, love, LOVE this book!!! !